American astronaut who set a record for extravehicular activity and was the second man to set foot on the Moon. The honor you have given us goes not to us as a crew, but to ... all Americans, who believed, who persevered with us. What Apollo has begun we hope will spread out in many directions, not just in space, but underneath the seas, and in the cities to tell us unforgettably what we will and must do. There are footprints on the moon. 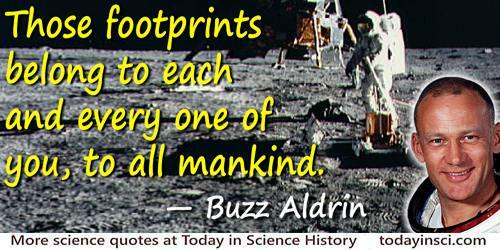 Those footprints belong to each and every one of you, to all mankind. They are there because of the blood, sweat, and tears of millions of people. Those footprints are the symbol of true human spirit. From his acceptance speech (13 Aug 1969) for the Medal of Freedom presented to him as one of the three astronauts on the first manned moon landing mission. In Leon Wagener, One Giant Leap: Neil Armstrong's Stellar American Journey (2004), 226. This has been far more than three men on a mission to the Moon; more still than the efforts of a government and industry team; more, even, than the efforts of one nation. We feel this stands as a symbol of the insatiable curiosity of all mankind to explore the unknown. We’ll get to the details of what’s around here, but it looks like a collection of just about every variety of shape - angularity, granularity, about every variety of rock. The colors - well, there doesn’t appear to be too much of a general color at all; however, it looks as though some of the rocks and boulders [are] going to have some interesting colors to them. Over. 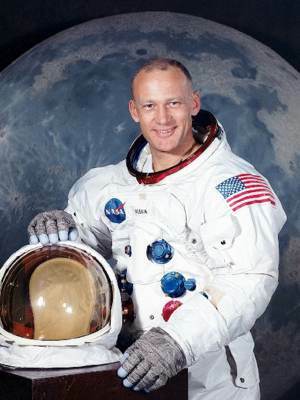 20 Jan - short biography, births, deaths and events on date of Aldrin's birth.